There is no other acoustic guitar company with the history of C.F. Martin guitars. For well over a century and a half, the Martin Guitar Company has been continuously producing acoustic instruments that are acknowledged to be the finest in the world. 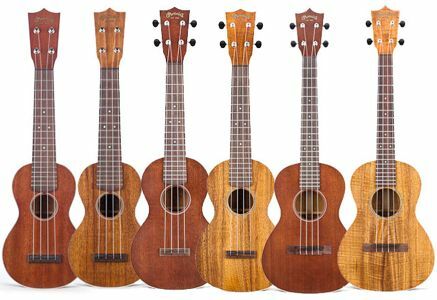 C. F. Martin & Co., Inc. has announced that six new ukulele models will be introduced at Musikmesse Frankfurt 2011, which takes place annually in Germany. 2 Uke features a solid mahogany body, solid East Indian rosewood fingerboard and newly-designed bridge, with an applied dovetail neck to body joint, black tusq nut and black compensated tusq saddle, friction peg tuners with white tuner button and a satin lacquer finish. Also includes grained ivory top binding, and beautiful hand inlayed black and white wood fiber rosette. 2 Concert Uke features characteristics of the 2 Uke, but in concert size, and with black tusq nut and saddle, geared peg tuners and black tuner button. 2 Tenor Uke features characteristics of the 2 Uke, but in tenor size, and with black tusq nut and saddle and a tie-block bridge. 2K Uke includes solid flamed Hawaiian Koa top, back and sides in a satin lacquer finish, rosewood fingerboard and bridge, black tusq nut and compensated tusq saddle, friction peg tuners and white tuner button. Similar to the 2 Uke, this model includes grained ivory top binding, hand inlayed black and white wood fiber rosette. 2K Concert Uke features characteristics of the 2K Uke, but in concert size with black tusq nut and saddle, geared peg tuners and black tuner button. 2K Tenor Uke features characteristics of the 2K Uke, but in tenor size with black tusq nut and saddle, geared peg tuners, black tuner button and tie-block bridge. All six of these ukes are manufactured in Martinï¿½s Nazareth factory, strung with Martin ukulele strings and feature a unique pressed stamp at the back of the headstock. The list prices on these new instruments range in price from $1449 to $1649 USD. Learn more about Martin guitars at http://www.mguitar.com.